Over the years, big car brands like Aston Martin, Mercedes Benz and Bugatti have all put out stunning superyachts. Japan’s marque car brand, Lexus, revealed earlier this year its first water-birthed design under their latest ‘L-fitnesse’ title. Titled LY 650, the study vessel will showcase Lexus’ unique flare and eye for technique, utilising the heritage of the brand and artisan skills whilst also making it luxurious and practical. 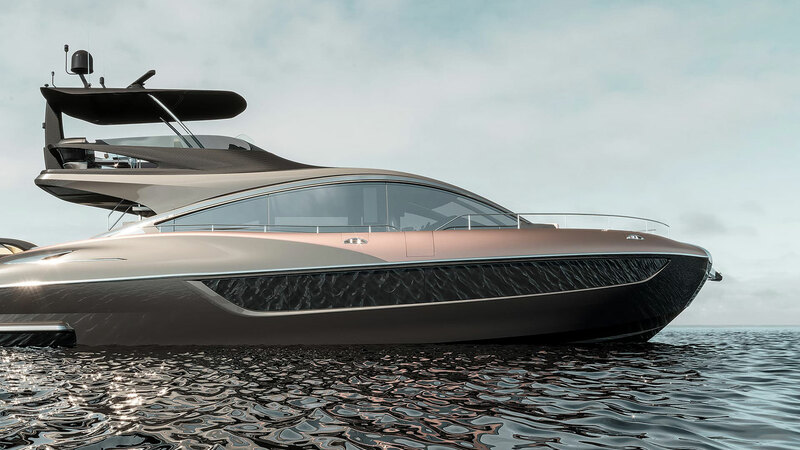 On the outside, the hull is fitted with hand-laid carbon-fibre and vacuum-infused polyurethane resin which is coated in a metallic silver and rose-gold. The concept boat stretches at a 65-foot open sport cruiser and fits a strong, prominent bow with curved accents on the deck. On the inside, the boat will feature luxury staterooms that will comfortably fit up to 15 guests. The internal design was crafted by boat-builder, Marquis-Larson Boat Group, and is padded out with wooden finishings, a dining area and entertainment space. This boat really is keeping the feeling of Lexus going, whether it be on or off the water. In true Lexus fashion, everything is connected via a Bluetooth system that will ensure security function and smartphone integration. This concept boat is likely to be on the market at the end of this year. Shigeki Tomoyama, Executive Vice President of Lexus, told press upon the concepts’ release that he wished to invite a “luxurious lifestyle” and “mobility” to the ocean.